If your looking for a place to create or host your website, email or register a domain name here at IISNet-Networks we provide the best web hosting for small business and SMEs. Since 2003 our Professional Hosting Services have enabled businesses and individuals alike to create and serve website content to the Internet. Our expert levels of service include domain name registration, ecommerce hosting, personal websites, DNS services, VPS and bespoke web hosting services. Our Domain Hosting solutions include a FREE SSL Certificate and a cPanel control center to manage every aspect of your website hosting such as Webmail, FTP, email forwarders, file manager. Also included are 100’s of FREE Apps like WordPress, Joomla, Blogs and forums to make creating your website very easy! HTTP/2 Hosting All our web hosting servers are HTTP/2 enabled which means quicker website loading times, applications run faster, simpler, and more robust. Need to find web host fast? purchase any hosting plan and we will create a 3 page starter WordPress website for you FREE! All web sites hosted on SSD Drives for super fast access! Professional Hosting at an affordable price. That’s what you get with every web hosting package that you purchase from IISNet-Networks. We have a 30-day money back guarantee – if you’re not satisfied, you’ll get 100% refund. Please feel free to take a tour around our website or contact us with your questions or to request our bespoke services. Our Domain Hosting services have the latest cPanel control center featuring a whole host of professional web hosting management tools to make creating and working with your website and email a breeze! “Softaculous” is our one click install software app and includes over 300 free applications like WordPress, Joomla, Blogs, ecommerce and cart apps etc. Security tools to password protect Directories and deny IPs. Logs. View latest visitors, check bandwidth usage and error logs. PHP Web Hosting with multiple php versions available from php 5.4 >> php 7 hosting. Mail Tools. Create email accounts, Manage Webmail, Add e-mail Forwarders, Create Autoresponders and Mailing lists. Create MX entries and Account Level and user level. Your VPS will be installed the same day and is easily upgradeable on the fly within minutes of your request being received by one of our experienced technical staff. Your Virtual Private Server will have full root access available to you through SSH . SolusVM is a powerful GUI based VPS management tool. This control panel gives you full control over your VPS and has lots of useful tools. 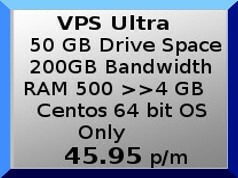 Should you need any technical support with your VPS we are always available 24/7 . Please don’t hesitate to contact us should you need assistance.